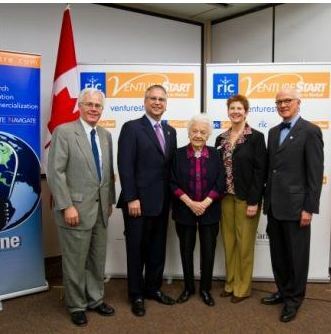 The VentureStart program, supporting entrepreneurs who have developed innovations or ideas for business start-ups, was announced today by the Research Innovation Commercialization (RIC) Centre. VentureStart is designed to enhance the success rate of start-up enterprises in Southern Ontario through business training for technology entrepreneurs, and an opportunity of matching seed financing up to $30,000 to launch their new venture. To be eligible for the VentureStart program, the entrepreneur must be a university or college graduate of a science, technology, engineering or mathematics program, and must reside in southern Ontario. Full details of the program and sign-up forms are available at www.venturestart.ca. The program comprises two phases, a Business Skills Development phase and a Business Launch Support phase. Since RIC Centre covers half the cost of the $3,400 skills development training phase, the enrollment cost for eligible entrepreneurs is only $1,700. There are no other costs for the entrepreneur to continue in the program, other than the requirement of matching funds for any seed financing ultimately received, up to a maximum of $30,000. For entrepreneurs who successfully complete the first phase, RIC Centre and its partners from the Ontario Network of Excellence (ONE), will provide mentoring by their Entrepreneurs in Residence, together with an extensive portfolio of the key support services that are typically required for the successful launch and operation of a new business. To qualify for seed financing, the entrepreneur must complete the business training program, which provides the foundation for creating a business development plan for their new venture. They must also complete a Critical Factor Assessment (CFA), which evaluates their plan against 42 factors that have been identified as critical for venture success. The CFA identifies flaws to be addressed in order to provide the venture the best likelihood of succeeding. Funded through the Federal Economic Development Agency for Southern Ontario’s (FedDev Ontario) Scientists and Engineers in Business initiative, with support from the members in the Ontario Network of Excellence and the Canadian Innovation Centre (CIC) the program expects to train as many as 450 entrepreneurs over 15 months, and provide as much as $4 million in seed financing to qualified applicants. Peel Region’s hub for innovation and entrepreneurship, the Research, Innovation, Commercialization (RIC) Centre was launched in 2008 as a not-for-profit organization supporting the development of innovation and entrepreneurship in Mississauga, Brampton and Caledon. RIC Centre provides commercialization support to help new entrepreneurs and seasoned business people take technical innovations to market, with experienced advisors and Entrepreneurs in Residence who guide its clients every step of the way.